Fake hair, airbrushed make-up, spray tans, and glitter. Beautiful girls cross the stage with hopes of taking home a huge crown. These girls are pageant queens, only, they’re not your average Miss America—they’re toddlers. 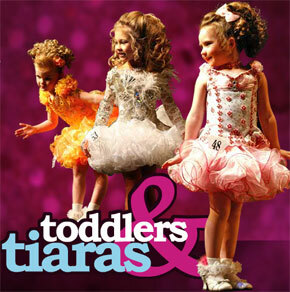 On the TV show Toddlers & Tiaras, TLC gives America an inside look at the cutthroat adolescent pageant world. Girls and boys as young as six months old participate in the competitions and prepare with unimaginable measures. For example, three-year-olds get spray tans and their eyebrows waxed so they can “pop” on stage. This, of course, is not the divas’ choice, but their mothers’, which raises the debate of whether the parents of the pampered princesses are abusing their children. Some critics claim that such practices are child abuse, while others, in defense of the pageant moms, say that such preparation is necessary for a win. It’s not really abuse, but I would never put a young child through the waxing or tanning sessions that are so prevalent on the show. Poorly-behaved children are common themes in the show. Spoiled brats kick and scream to get what they want, and their parents give everything to them on silver platters. Competing in pageants probably spurred this kind of behavior, and the worst part is, the parents accept it. On the show, the first thing pageant parents talk about is money. The amount of money put into costumes, hair pieces, coaching and even fake teeth is crippling, and most of the parents even have to work two jobs. One thing you can count on in almost every episode is the unstoppable drive the parents have to win the top title. Sure, some parents put their son or daughter into pageants to gain confidence, but more often than not, the parents enter their kids with very high expectations of winning. Many instances of bad parenting are seen on the show, and some of the most outrageous include allowing kids to use a pacifier at the age of four, and forcing kids to perform against their will. The show is very funny, even though it could promote bad parenting. I even find myself rooting for my favorite competitors. I don’t agree with the whole idea of dolling up little girls who can hardly walk, but Toddlers & Tiaras is, nonetheless, entertaining.